Many imports have been coming from her over the years, with fantastic results from the show-rings and in the breeding work. She is an indispensable mentor for me in the dog world. Ch Genisim Wot A Bee was the Top Toy in Sweden 2000 and has bee placed BIS many times Year 2001. Ch Livanda Micklee De Canio was imported 2001 from Mrs Andrea and Mr Stuart Livesey. The Livanda kennel, witch is a connection back to the original line. In September 2004 we also imported Goldpeke Navaho Warrior from Kara and Mark Armstrong, GB. "Dillon" will work as an outcross in our breeding program. He has a stunning head, beautiful temperament and remarkable soundness. The Micklee Livanda and Genisim lines do now work together in our breeding, producing a continuous stream of champions every year. We also imported Livanda Montero in 2004 from Andrea and Stuart Livesey, England. His father GBCH Livanda Santana, is after GBCH Livanda Micklee Ginola, brother to De Canio. Monteros grandmother is GBCH Yakee A Dangerous Liaison, who became BIS on Crufts! 2006 saw the arrival of Genisim Harvey Wallbanger from Jennifer Sims, England. He will contribute to bringing more red color to our Pekingese. He is father to Drakedram Singapore Sling, who so far has become BIS placed puppy in 3 consecutive shows, and recently also been exported to the Czech Republic. 2007 we also imported Bilanciatos Love Of The Century from Espen Andersen, Norway. She is daughter to the BIS winner on the Swedish Pekingese Special 2007, NUCH Stsanja Talk Of The Town. He is for the moment here for breeding purpose. 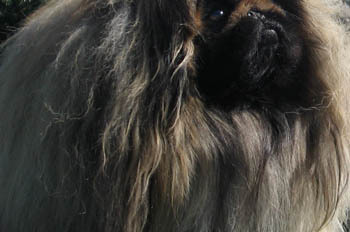 The breeding of Pekingese started 1969 of my father Mr Henry Franzén, and was mostly based on imports from the Micklee line, Mrs Joyce and Mr Jack Mitchell. 1996 was the contact with Mrs Jennifer Sims established, after studying her successful breeding work for many years.